“The market is beautiful and I like it, that’s why I’m here.” Hong J., Crossroads Farmers Market shopper. There’s no doubt that the shady street and colorful sights of Crossroads Farmers Market make for a great place to spend a warm summer day. But for local immigrants in Takoma Park, Maryland – home to low-income families from over 100 countries – Crossroads’ appeal runs much deeper than a festive place to gather. The market’s beauty has an intrinsic quality – beauty locals find in taste, abundance and access. Many rely on the market’s bounty for the fresh, affordable, and traditional foods sometimes hard to find at neighborhood grocery stores. Crossroads Farmers Market was the first in the country to launch a “double dollar” incentive program to match the value of SNAP benefits spent at market. Its Fresh Checks program has distributed more than $360,000 in fresh produce to over 11,000 families since opening its doors in 2006. It’s also a place of opportunity. Crossroads Microenterprise Training Program offers free, bilingual business training to help aspiring local food entrepreneurs grow a business. While beauty is found in prosperity, it’s found in diversity too: 75% of Crossroads’ vendors are immigrants. To understand what makes Crossroads Farmers Market beautiful to its vendors and community, there’s no better way than to let them tell you themselves. Watch the videos below to see the beauty of Crossroads through their eyes. Read more about Crossroads’ below and follow their story this week on Instagram! Gabrielle Rovegno: This is Crossroads 10th season, we started as a seasonal market and grew into a full time non-profit. Crossroads was the first market in Maryland to accept SNAP/EBT and the first market in the Country to provide an incentive/match for individuals using their federal nutrition benefits. 75% of our vendors are immigrants and we work hard to translate our materials into Spanish, Russian, Cantonese, Mandarin and Vietnamese. Customers from all around the world come to our market and says it reminds them of home. We are an outdoor seasonal market. 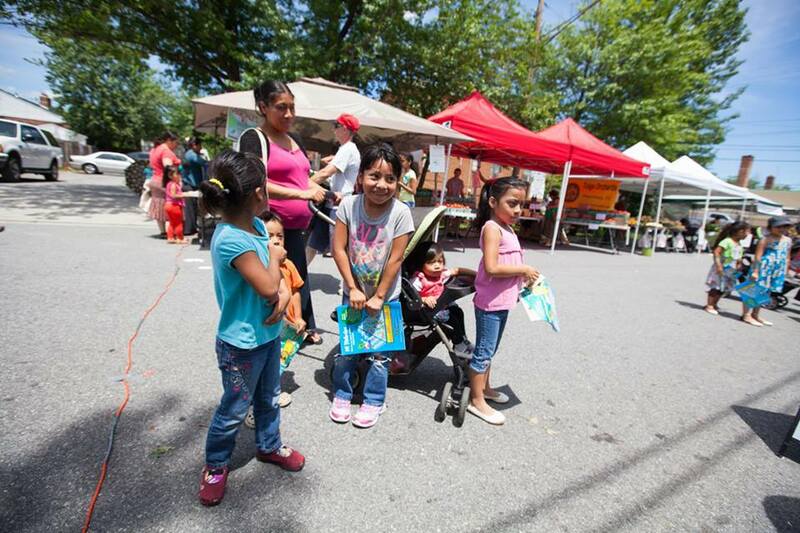 On Wednesday’s between 11am – 3 pm the residents of the Takoma/Langley Crossroads can buy fresh, local produce. The Takoma/Langley Crossroads has become known as the “International Corridor,” given it’s richly diverse, mostly immigrant, low-income community. Straddling the border of Maryland’s Montgomery and Prince George’s Counties just outside Washington, D.C., the Crossroads area has experienced many social, cultural, economic, and physical changes over its history. Today, approximately 23,000 people live in proximity to the Takoma/Langley Crossroads, including immigrants from an estimated 120 different countries. It is one of the region’s most distinctive and broadly representative international communities: 62% of the population is foreign born and 52% are not US citizens (ACS, 2010). Most (83%) of the foreign-born residents come from Latin America and 11% are from Africa. Predominant countries of origin are Guatemala (37%) and El Salvador (26%), and the percentage of Hispanic or Latino population in the area is very high, at 65% (US Census Bureau, 2010). Everyone in this area comes here and converges at Crossroads. FMC: Advertising to such a diverse population must be a challenge? What methods work best to promote your market? GR: Information about the market mostly gets out through word of mouth and community flyering. Though we announce these things on our Facebook page, most of our shoppers are offline. We go to community events and make announcements, and advertise on the local tv and radio stations. We also rely on our community partners to advertise our market among their program participants. FMC: What are some challenges and successes experienced at Crossroads? GR: Crossroads is a victim of it’s own success. In the last few years we’ve had trouble raising enough money in matching funds to meet the growing customer base. While the rich diversity we have present at market makes us strong and unique, it has also provided some challenges with cross-cultural communication. There are many different shopping styles that put stress on our farmers. Over the last nine seasons, the market has experienced tremendous growth: More than $360,000 in incentives, called Fresh Checks, have been distributed to over 11,000 residents who use them to buy fresh fruits and vegetables.